Yiddish journalist; born in Lida, government of Wilna, April, 1868. 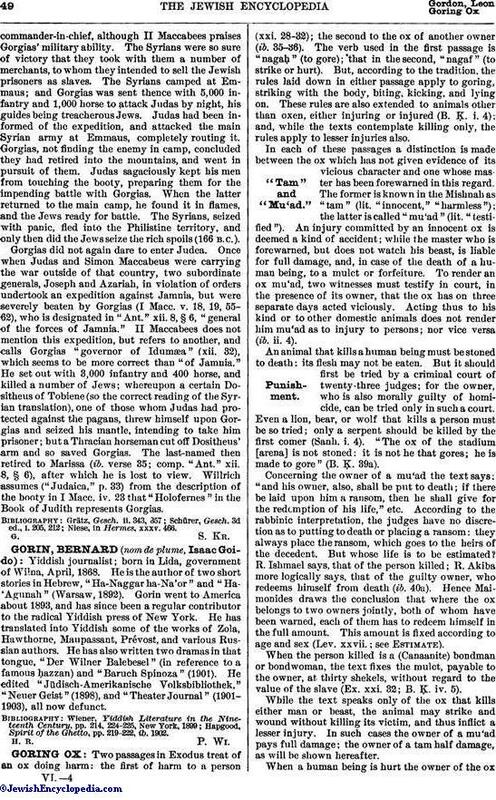 He is the author of two short stories in Hebrew, "Ha-Naggar ha-Na'or" and "Ha-'Agunah" (Warsaw, 1892). Gorin went to America about 1893, and has since been a regular contributor to the radical Yiddish press of New York. He has translated into Yiddish some of the works of Zola, Hawthorne, Maupassant, Prévost, and various Russian authors. He has also written two dramas in that tongue, "Der Wilner Balebesel" (in reference to a famous ḥazzan) and "Baruch Spinoza" (1901). He edited "Jüdisch-Amerikanische Volksbibliothek," "Neuer Geist" (1898), and "Theater Journal" (1901-1903), all now defunct. Hapgood, Spirit of the Ghetto, pp. 219-222, ib. 1902.